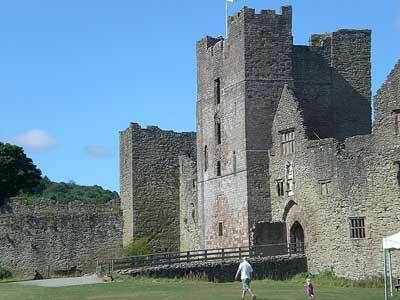 Edward IV founded the Council of the Marches of Wales in the late 15th century, its headquarters were in Ludlow Castle. The Council administered most of Wales and Shropshire and the adjacent English counties. 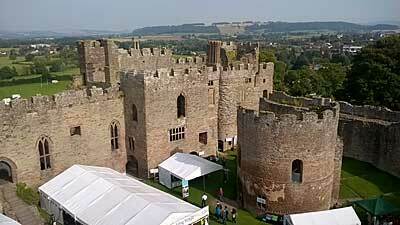 The Council's courts were very active, and the castle and Ludlow were full of lawyers, clerks and royal messengers. The Council of the Marches ceased to exist in 1689, and after this the castle gradually fell in to disuse and disrepair, although Ludlow itself was still on a wave of prosperity. (except Christmas Day and December & January weekdays). Current Admission (2017) prices: Adults £5, Senior/Student £4.50, Family £13.50 (2 adults + 2 children), Children £2.50, Children 6 yrs & under: FREE. You are advised to check the Castle is open to the public before making your journey, please visit Ludlow Castle web site admissions page. As well as being open to the public throughout the year, the inner and outer baileys are used for several festivals and other events each year, notably: Ludlow Spring Festival, Ludlow Food and Drink Festival and Ludlow Medieval Christmas Fayre.